The Udp Client / Sever is a useful tool for testing some udp services, as well as firewalls and intrusion detection systems. This tool can also be used for debugging the program and configuring other network tools. 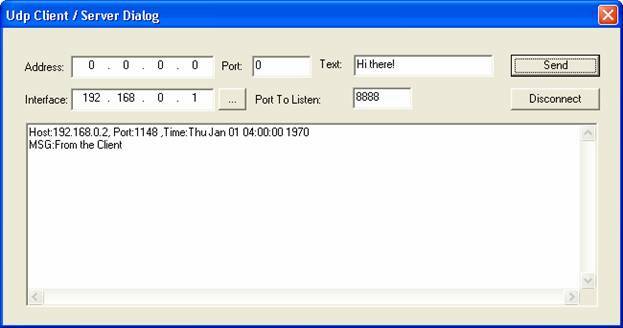 To bind a server to a specific port, enter the server Ip address in the field Interface and enter the port in the field Port To Listen. The client parameters should be filled in the first row. Address contains client Ip address and Port contains the port to which the client is binded. To send a text enter the text in the Text field and click on the Send button. Clicking on the Disconnect button will disconnect the client from server.